Bird Science Activities for preschool through second grade. Make stale bread bird feeders! Take a piece of bread. Have a child cut out a shape with a large cookie cutter. Punch a hole at the top. Thread a piece of twine through the hole and tie in a loop. Let dry overnight. Spread with peanut butter and press into bird seed. Hang outside for the birds to enjoy! For an activity to go with spring and birds returning, try this. Make bird nesting balls. Collect mesh vegetable bags, such as what grapes, oranges, potatoes come in. You may cut them to the size you need. Also collect such items as the following: leftover thread (I sew and save all my thread clippings), yarn pieces, tiny fabric scraps or strips. Also, you can add Kleenex, cotton balls. Have the children take a bit of each of the materials and place them in the mesh. Pull the mesh together around the items they have placed in the mesh. Take a rubber band and secure the ends together. Using a yarn needle, thread in a piece of yarn and tie ends together to make a hanger. Place these nesting balls outside in trees or areas high enough that the birds feel safe. They will come and pull these materials out thru the mess and take them to make their nests. Have the children observe every so often to see if any of the materials have been removed from the nesting balls or if they see any nests with familiar materials in them. Talk to your class about the kinds of things birds use to make nests. Remind them that birds like small sticks and soft things to keep the eggs warm and safe. If you have a real nest to show them do so. Then give each child a brown lunch bag and take a nature walk. Have the children pretend they are birds and collect things for their nests. When you return to the classroom have a few children at a time come over and empty the contents of their bag on a table. Help the child roll down the sides of the bag all the way to the bottom of the bag shaping into a nest. Then provide glue and brushes so the children can brush the insides of the bag (bottom and sides) with glue. Then have the children press some of the things they collected into the glue. They probably won’t be able to use all they have collected. Remind them that they need to have room for the eggs. These look remarkably like the real thing. Let dry. Let children put their eggs in their nest. This looks so cute and realistic. 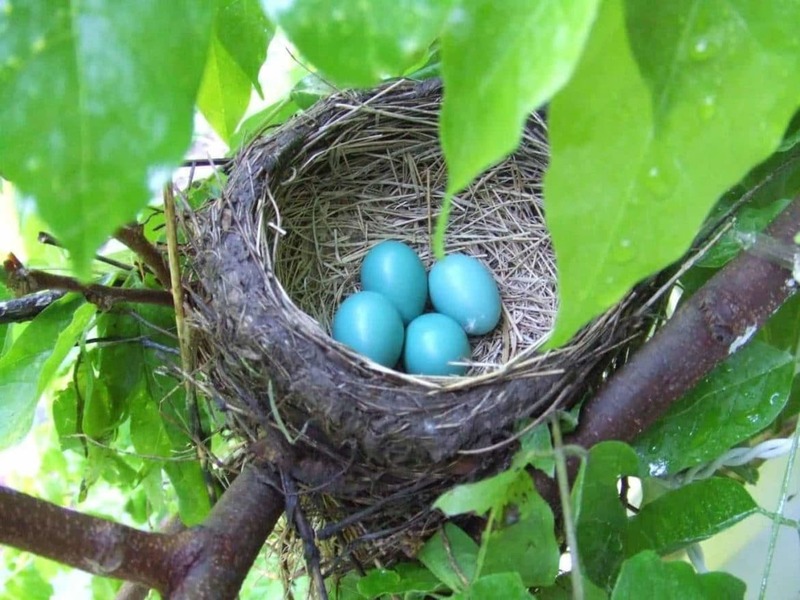 Collect several types of bird nests or pictures of bird nests. Discuss the ways they are built. Provide some mud, sticks, leaves and other natural materials that birds use to make nests. Let the children roll up their sleeves and dig in! Can they make a nest like a bird? Bird nest-making skills will be greatly appreciated for this activity. Spread peanut butter on a pine cone and roll in birdseed. Hang in a tree that is visible from the classroom. Set up a bird watching station with binoculars and a journal. Encourage the children to record with words or illustrations whatever they see. One child is chosen the be the mother bird. The mother needs a gummy worm. Blindfold her. Have a baby bird move quietly around the room and find a spot to roost. The baby bird must tweet to tell the mother where it is. Once the mother finds the baby she can give it the gummy worm! The baby is now the mother and another child is chosen to be the baby. Children stand in a circle, holding hands, arms up…windows are open. One or two bluebirds are in the center. As you sing the song the birds weave in and out the open “windows”. Sing as follows:… Bluebird, bluebird through my window, bluebird, bluebird through my window, bluebird through my window. (children bring down arms to close the window)….oh blue bird aren’t you tired. Birds want to stay inside the circle as windows are being closed. You can change the name of the birds to fit with your theme….e.g. blue jay, cardinal, sparrow, etc. Cut out different pictures of birds and play a game which one flies which ones don’t fly.